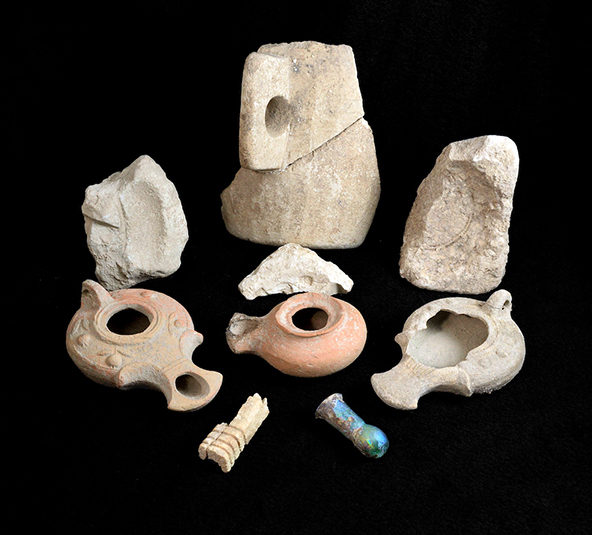 The Shikhin Excavation Project, a collaboration between Samford and Kinneret Institute for Galilean Archaeology at Israel’s Kinneret College, has previously shed new light on a small community of Roman period clay oil lamp makers. Each summer, Strange and associate directors Mordechai Aviam of Kinneret and Tom McCollough of Centre College and Coastal Carolina University lead a team of students and volunteers from Samford and other universities. This year nine Samford students took part in excavations. Notable finds this season included three complete lamps, including one with a pomegranate decoration and another with decoration apparently representing the leaves and fruit of the myrtle plant. It is the only known example of such decoration on a lamp. Strange said myrtle was used as a medicine and still features in the traditional Jewish celebration of Sukkot. Archaeology is inherently interdisciplinary, and two other Samford professors applied their special expertise to the project this season. Samford biology professor Betsy Dobbins, assisted by communication studies major Emily Brennen, used a floatation process to extract small plant and animal remains from excavated soil. Dobbins hopes the samples will show which plants grew in the area, when they flourished and how their export and storage might have related to the work of the potters. Another Samford team– chemistry professor Brian Gregory and chemistry and classics major Jewel Trail–analyzed Shikhin pottery samples on Samford’s Homewood, Alabama, campus. Using inductively coupled plasma (ICP,) they will determine the elemental makeup of Shikhin’s clays. They hope to learn which pottery forms Shikhin’s workshops distributed to cities and villages within the Galilee and beyond. Analysis of animal bones by the project’s zooarchaeologist Carole Cope suggested that Shikhin might also have produced prized gazelle parchments, possibly for Jewish academic use in nearby Sepphoris. Strange said Dray originally developed the workshop for a 2017 research symposium at Kinneret in honor of Strange’s father, James F. Strange, a University of South Florida professor and archaeologist of the region. The elder Dr. Strange died in March, but his wife, Carolyn, attended the Shikhin dig as she has for decades, bringing breakfast to the team in the field and organizing other important aspects of the trip. “I was pleased Mom was able to come,” Strange said. “I was glad for the returning team members to surround her with support, and for the first-timers to get to know her and appreciate how important she is to the project.” Strange said his mother’s official title is “Camp Manager,” sometimes rendered in Latin as Mater Castrorum (“Mother of the Camps”). “Miss Carolyn,” as the students call her, has endowed the Carolyn Midkiff Strange Fund for Biblical Archaeology at Samford to provide scholarships for students participating in the dig, support publication of final reports, and fund equipment purchase and rental to aid the ongoing excavations. Those interested in contributing to the Carolyn Midkiff Strange Fund for Biblical Archaeology, or who wish to volunteer with the Shikhin Excavation Project, should call James Strange at (205) 726-4543 or contact him via e-mail at jrstrang@samford.edu.